Learning of other physicians’ job-search journeys can help you anticipate, plan and execute your own. Until you get to your job search, the path to a career in medicine is quite regimented: Study a pre-med curriculum. Apply to medical school, then to a residency program. After residency, you either apply for a fellowship or begin looking for a job. And that’s when the systematic, methodical process vanishes, leaving some physicians unsure of how exactly, or when, to begin their job search. The path to a new opportunity doesn’t come with a pre-written map or compass. So it can help to hear what other physicians’ job searches looked like as you chart your own course. “Like many aspects of medical education, this is one of the things that you don’t formally ‘learn,’” says Jha. The success of your search, and the order in which you uncover and pursue opportunities and resources, is largely dependent on timing. Allow yourself ample time to explore all the jobs that may be available to you so you can negotiate from a position of strength, rather than being rushed and under pressure to accept anything that’s offered. When it comes to looking for your first or next job, “Start early,” advises Zachary Liner, M.D., an interventional radiologist with North Oaks Imaging Associates in Hammond, Louisiana. Liner began his job search in the middle of his first fellowship after residency and before he had even started his second fellowship—17 months before he knew he’d be available to start. According to the 2017 Survey of Final-Year Medical Residents conducted by Merritt Hawkins, a national health care search and consulting firm, 72 percent of medical residents start their job search within or before a year of finishing residency; 28 percent wait until they are six months from completing their training before beginning their job search in earnest. Patty Shipton, physician recruiter with Penn State Health in Hershey, Pennsylvania, says that a year is just about right for a physician’s job-search process. Physicians in their last year of residency or fellowship generally start looking for a position in early fall, she says. That’s when recruiters begin attending career fairs and conferences armed with a general idea of upcoming openings that will need to be filled. Shipton also collects CVs for unexpected openings that occur from time to time. Chris Mason, D.O., MS, is regional medical director for the Western region of American Physician Partners and is based in Albuquerque. The earliest a resident can commit to a job is right after their intern year. And while that’s not typical, it’s possible, he points out. To entice physicians to sign as soon as they’re eligible, employers may offer incentives including sign-on bonuses, stipends and loan forgiveness. The major downside to signing a contract so early in the job-search process is that you’re committed to work somewhere long before you’re finished with residency. During that time, you may make all sorts of decisions that could interfere with that employment arrangement. For example, you might decide you want to live elsewhere in the country, you might get married to someone who wants to live somewhere else, or you might decide you want to work for a specific practice or even switch specialties. A lot can happen over the course of several years of training. PracticeLink.com is where physicians in all specialties go to find the most comprehensive database of available jobs. PracticeLink is not a staffing agency or third-party recruiter. Instead, it’s a comprehensive database of jobs posted by in-house physician recruiters at more than 5,000 hospitals, health care systems and other medical facilities. Here’s how PracticeLink can help you. PracticeLink provides full access to jobs, employer information and recruiter phone numbers even to confidential job seekers. Sign up for a free account, and we’ll send you alerts when new jobs are posted in your specialty and geographic preferences. That’s invaluable information when you’re actively searching; interesting (and enticing) when you’re not. PracticeLink’s physician relations team can help you on the phone or on the road. Call (800) 776-8383 Option 2 for a quick interview. We’ll send you some jobs to consider, and share your criteria with a network of in-house physician recruiters if you’d like. Or, visit PracticeLink at your specialty’s national conference. We’re constantly mining the experiences of physicians, physician recruiters and industry experts to provide you with answers to all your job-search questions. Access our extensive career resources at PracticeLink.com. By early fall, most physicians usually know where they want to be geographically, says Shipton. She finds that they often they want to move to be closer to family. Or they’re clear about whether they want a big city or small, urban or rural setting, mountain or beach, or a specific region of the country. Many have also started to research which hospital systems or practices have openings in their specialty—or are likely to soon. Making his job search even more challenging was that not only was Liner looking for a position in a field with very few openings each year, but he also had a very small geographic target area. 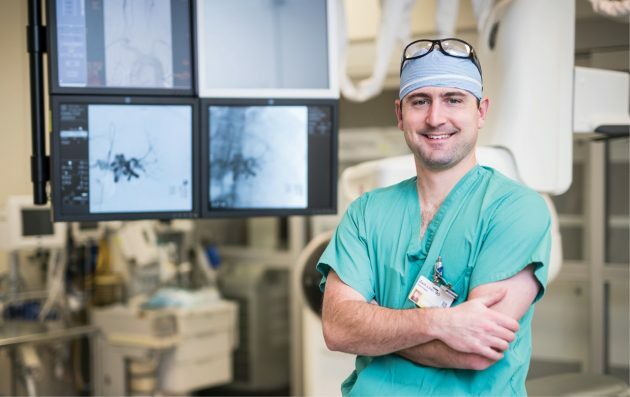 Most interventional radiology jobs exist in major cities, he explains, but he and his wife had decided that after living in New Orleans, Texas, San Francisco, and Rochester, New York, they wanted to make southern Louisiana home—where he and his wife had grown up. He knew that his odds of finding an interventional radiology opening in southern Louisiana were slim, so he wanted to start introducing himself to anyone in Louisiana who might have a need for a physician with his skillset. “It was constantly on my mind that the job I wanted wasn’t open—that I had to create it,” he says. Few programs were looking for a doctor with training in both body and neurointerventional radiology. “It’s a unique skillset that sets me apart,” says Liner, but with so few hospitals and practices actively looking for someone with such unique training, he was aware that his job search could be difficult. It was likely he would need to convince a practice that he would be a valuable addition, and work with them to create a new role rather than take over an existing position. Depending on your specialty, there may be opportunities at specific times of the year, such as at educational conferences and medical association meetings, to be considered for upcoming openings. 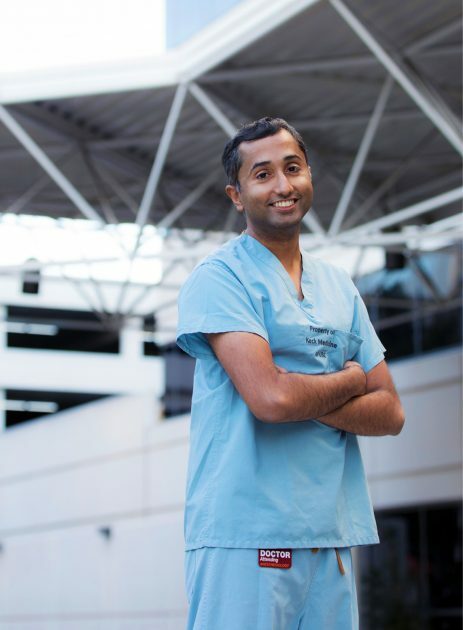 Jha, who was looking for a position in academic medicine, discovered after the fact that many academic departments interview graduating residents at the ASA (American Society of Anesthesiologists) annual meeting in October. Looking back, he says he should have started earlier and taken advantage of this interview opportunity. Ask your colleagues if your own specialty’s conference has a similar setup. If so, try to attend. Mason recommends networking through various local and national chapters of your specialty’s professional organizations. Take advantage of residency events and physician groups that provide opportunities for residents to mix and mingle with health care representatives. “Get involved,” Mason advises, to get to know attending physicians who can serve as referral sources and connectors to your dream practice. Tell me about the group’s financial health. Any chance it will be for sale in the next few years? Is this a W-2 or 1099 position? Is there a partnership track? What’s the process for becoming a partner? What is the call burden and caseload, and what kind of cases are covered? Are there opportunities for professional and leadership development? What would my role in the department be? “Try to get as much information as possible” before you make a decision about which job to accept, advises Jha. Don’t hesitate to be proactive. “If there’s a place you’re interested in, don’t be afraid to reach out to the recruiter,” Shipton says. “They may know of a future opening coming up.” Most in-house physician recruiters serve specific departments, so it’s useful to identify which recruiters are responsible for hiring physicians in your specialty at the employers you’re targeting. In-house physician recruiters are uniquely qualified to represent the opportunity and community for which they’re recruiting, as they are directly employed by the facility. It’s their friends and family whom you’ll be treating. Another option is to retain the help of an agency or staffing firm in your search. An agency may be able to alert you to jobs at multiple specialties through one point of contact. Liner decided that he needed the support of a professional adviser to help track down a potential employer that would meet all of his criteria. He chose Jeff Hinds, MHA, of Premier Physician Agency in April 2016. Liner worked on a cover letter and updated his CV to be sent out to prospective employers. He then sent out “feeler emails” to about 40 practices that Hinds had identified in cities and towns in Louisiana, Texas, Alabama and Mississippi to see what kind of interest there might be in a doctor with his training and experience. He also checked physician job boards and applied to a few opportunities. Almost immediately, Liner began receiving phone calls in response to his campaign. Although most recruiters said, “We don’t have a place for someone with your skill set,” they also told him they would keep his materials on file in case something opened up later. Liner then followed up later with those that had expressed an interest to check in. Back-and-forth phone calls from the feeler emails continued for about six months, says Liner. Among the many “we don’t have a spot for you” phone calls were six calls from practices that were interested in speaking with Liner, three of which were in Louisiana. Jha describes his initial job search activities as passive, as he applied and interviewed “broadly” for jobs in both academic medicine and the private sector. “I had been passively searching for jobs in both environments, collecting contacts within different departments,” says Jha. Then at around the midpoint of his fellowship year, he began directly reaching out to different departments and groups he was interested in. “The department where I did my fellowship kept a list of key contacts within groups around the country, which was instrumental in securing many of my interviews,” he says. In addition, some physician job boards and physician recruitment agencies also provided outreach ideas. His proactive approach worked. “I actually got my job by directly emailing the chair of my department,” he says. You can be proactive even without having a name provided. On PracticeLink.com, for example, you can search by specialty, zip or employer, and reach out directly to the in-house recruiter representing the opportunity or organization. For the next five months, from August 2016 to January 2017, Liner flew out to interview with six different groups. He had one interview in August, three in September, one in November, and one in January. Many took weeks to schedule because he had to travel from his fellowship in San Francisco to the south during times he wasn’t required at the hospital. Finding common schedule availability was challenging. Liner had a strong sense that practices that initially said “no” because they didn’t have any openings at the time might eventually turn into a “yes” if a partner decided to move or retire. So he made a habit of staying in touch with all the practices and hospitals in his geographic search area. As he scheduled first visits with some groups, he was also scheduling second visits to two practices that had made offers following the initial site visit. He completed those two visits in January. After reviewing CVs gathered at conferences in September and October, Shipton’s next step is to schedule on-site visits to see if there may be a fit. During October and November, she typically invites the top in for a first on-site visit. Based on those in-person interviews, the interview team and department leadership collectively decide whom to invite back for a second visit, often with their families. Those generally occur in November and December. Offers are then made between December and February, she explains. Liner made it known to the practices he was considering that he was going to take his time in making a decision. Because he had started his job search so early, he had the luxury of time to thoroughly research each practice and speak with different people and departments within each practice. Likewise, candidates who are especially responsive can move the process along faster than normal. Twelve months after he started his job search, Liner accepted a job offer from a practice in Louisiana. In order to prevent any delays in receiving your hospital credentials or medical license, make sure you have quick and easy access to the personal information your employer will need, suggests Jha. That means collecting recommendation letters as soon as possible, keeping accurate and up-to-date procedure logs as you go through training, and scanning personal documents, such as identification, degrees, other licenses and immunization records so that you can send them at a moment’s notice, he recommends. “Be patient and start early so you can begin working on time,” Jha advises. Shipton says that credentialing, which can include a background check, review of letters of reference and other documentation, can take anywhere from one to three months depending on the state in which you’re applying. While there are common timelines for finding, considering and accepting a new position, there are also many extenuating circumstances. The typical timeline is just that: typical, but not the rule. Liner was looking for the equivalent of a needle in a haystack in Louisiana, so his timeline was extended. You can take a different approach, or operate at a faster or slower speed. It’s up to you. You can decide for yourself how much time to invest in identifying potential employers, researching programs, sending out CVs, talking to recruiters, visiting hospitals and practices in person, negotiating a contract, and preparing for your new role. You’ll also make a better decision if you do your own due diligence before signing any contracts. Ask lots of questions—“you can’t ask too many,” Liner says—to ensure you’re making the best decision for you. Marcia Layton Turner is a frequent contributor to PracticeLink Magazine.